Messier 74 (M74), nicknamed the Phantom Galaxy, is a grand design spiral galaxy located in the constellation Pisces. The galaxy appears face-on and has an apparent magnitude of 10. It lies at an approximate distance of 30 million light years from Earth. Its designation in the New General Catalogue is NGC 628. Messier 74 occupies an area of 10.5 by 9.5 arc minutes of apparent sky, which corresponds to a linear diameter of 95,000 light years, almost the size of the Milky Way. The galaxy is home to about 100 billion stars. 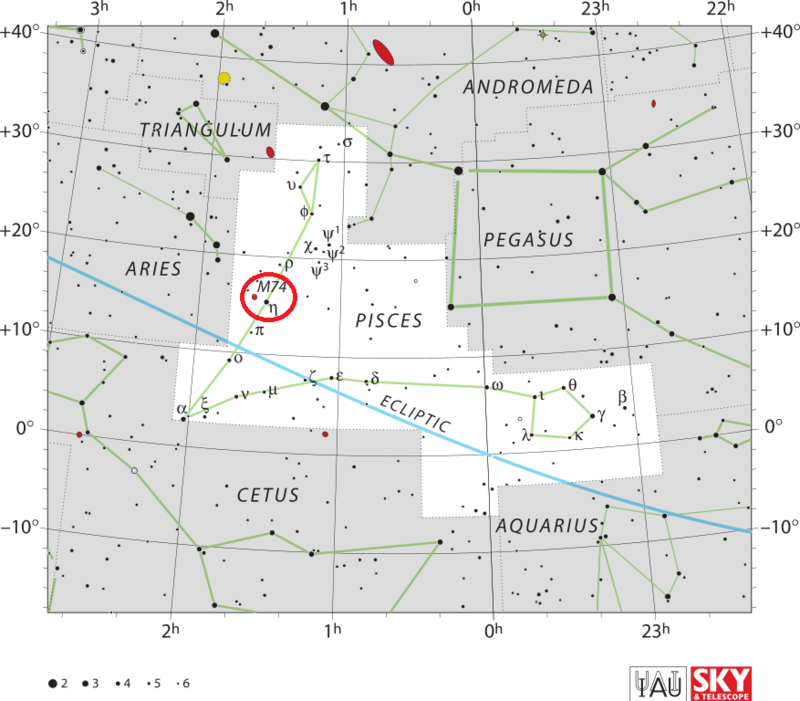 It can be found 1.5 degrees east-northeast of Kullat Nunu (Eta Piscium), the brightest star in Pisces. The star is only of magnitude 3.6, but can be located using the bright stars Hamal and Sheratan in the neighbouring constellation Aries. An imaginary line drawn from Hamal to Sheratan and extended for about 7.5 degrees leads directly to Kullat Nunu. 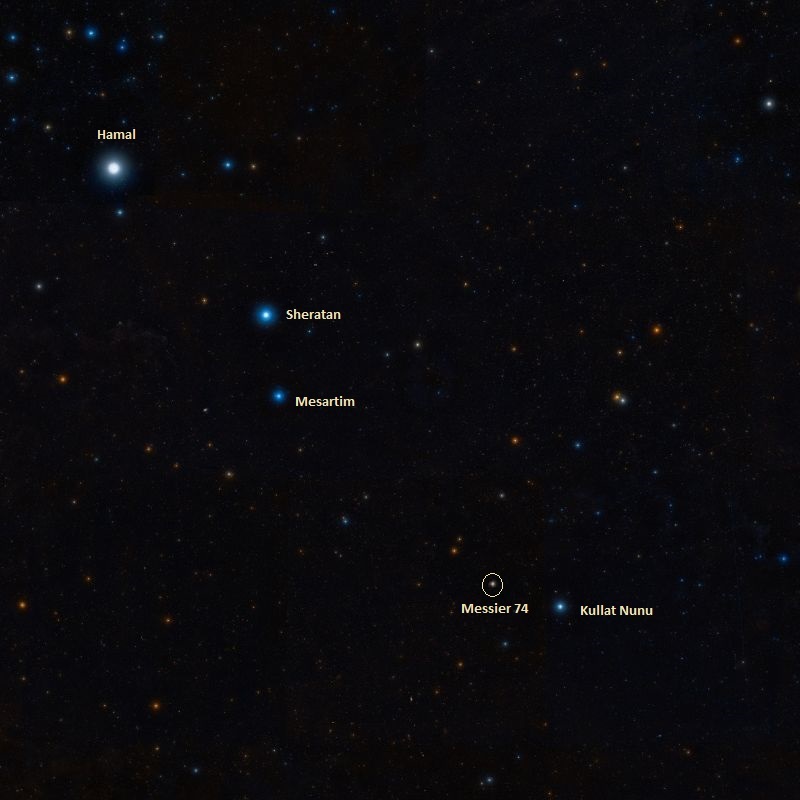 M74 is located 1.5 degrees from the star back in the direction of Sheratan. Messier 74 can be seen in large binoculars, but it only appears as a faint patch of light. Small telescopes will reveal the galaxy’s bright nucleus surrounded by a hazy halo, while larger telescopes will show the galaxy’s spiral arms. The galaxy looks similar to the Triangulum Galaxy (M33), but has a more defined nucleus. The best time of year to observe M74 is during the months of October, November and December. Messier 74 is not an easy object to observe for amateur astronomers because it has a low surface brightness and requires exceptionally clear, dark skies. 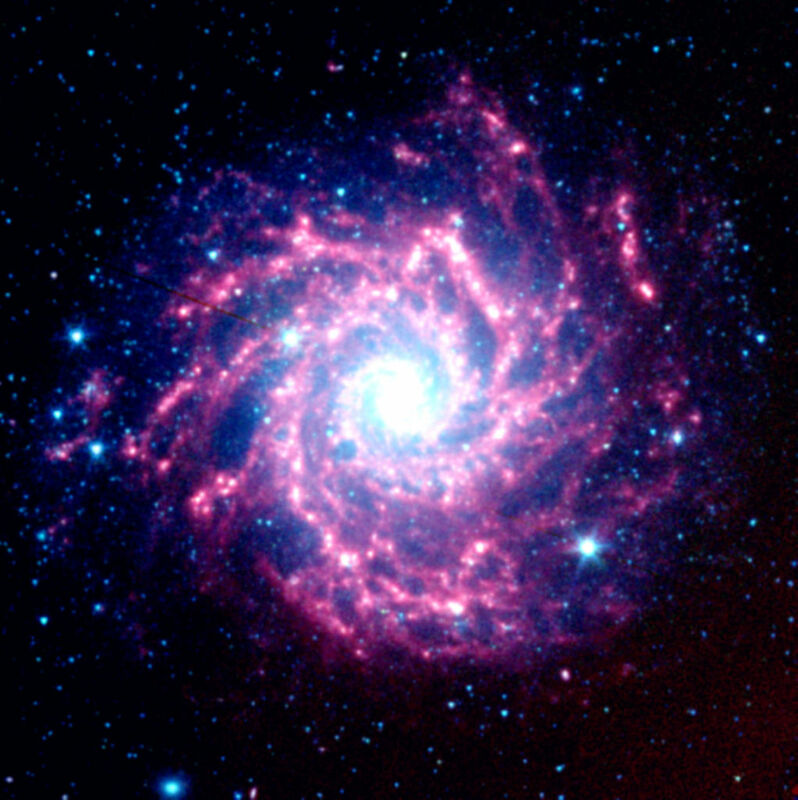 The only Messier object with a lower surface brightness is the Pinwheel Galaxy (M101), a face-on spiral galaxy located in the constellation Ursa Major. 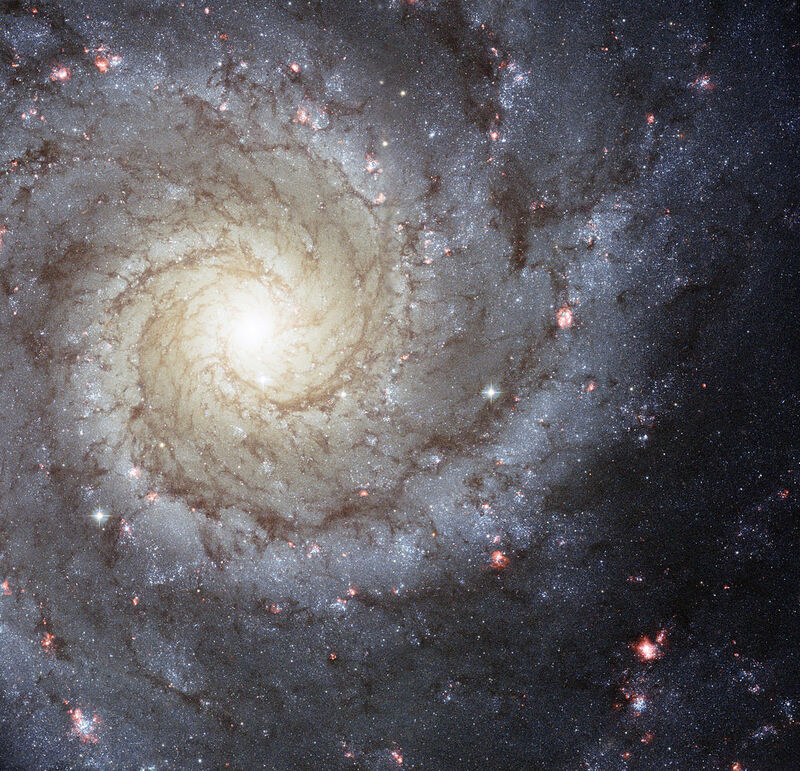 Messier 74 is a perfect example of a grand design spiral galaxy. It has two clearly defined spiral arms and its face-on orientation and large apparent size make it a frequent target for astronomers looking to study spiral arm structure. The spiral arms, which extend for about 1,000 light years, contain clusters of young blue stars and many starforming nebulae. The galaxy is receding from us at 793 km/s. 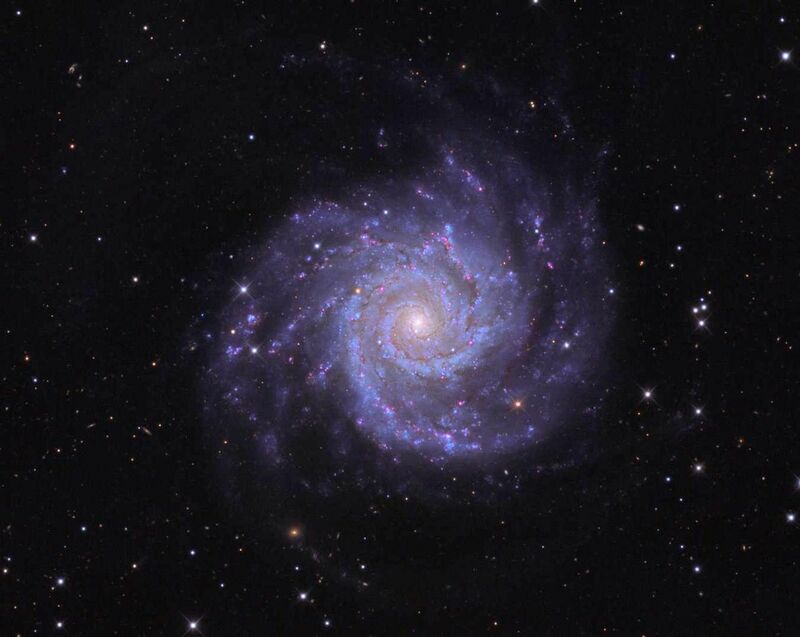 The symmetric appearance of M74 is suspected to be the result of density waves sweeping around the galaxy’s gaseous disk which, in turn, is the result of M74’s gravitational interaction with neighbouring galaxies. The interaction and collisions of the galaxies’ clouds are also responsible for the star forming activity seen along the spiral arms of M74. 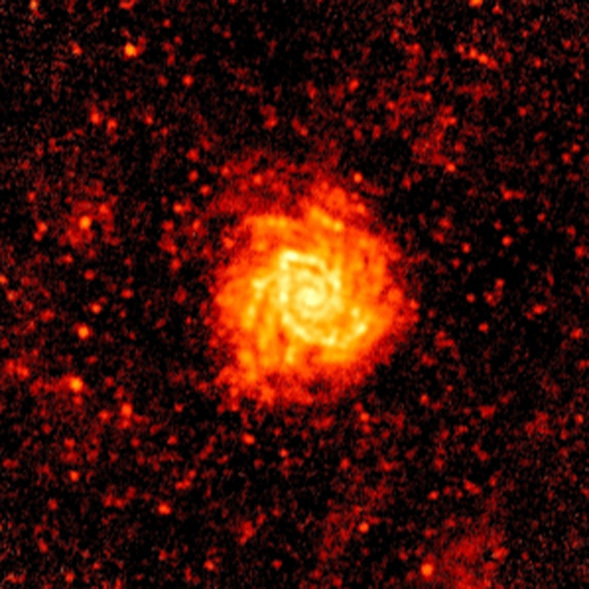 In March 2005, the Chandra X-ray Observatory detected an ultraluminous X-ray source (ULX) in the galaxy. The object has an estimated mass about 10,000 times that of the Sun and radiates more X-ray power than a neutron star in intervals of about two hours. The discovery indicates that there is an intermediate-mass black hole in the centre of M74. The X-ray source is identified as CXOU J013651.1+154547. A total of 21 X-ray sources have been discovered within the inner 5 arc minutes from the galaxy’s core. Messier 74 is the central galaxy in the M74 Group, a small group consisting of 5 to 7 galaxies located in the constellation Pisces. The M74 Group includes the peculiar Sm galaxy UGC 891, several irregular galaxies – UGC 1176, UGC 1195, UGCA 20 – and the peculiar and unique polar-ring spiral galaxy NGC 660. NGC 660 is the only galaxy of this type to have a late-type lenticular galaxy as its host. The galaxy likely formed when two separate galaxies collided a billion years ago. Three supernovae have been detected in M74 in recent decades: SN 2002ap in 2002, SN 2003gd in 2003, and SN 2013ej in 2013. ESO’s PESSTO survey has captured this view of Messier 74, a stunning spiral galaxy with well-defined whirling arms. However, the real subject of this image is the galaxy’s brilliant new addition from late July 2013: a Type II supernova named SN2013ej that is visible as the brightest star at the bottom left of the image. Such supernovae occur when the core of a massive star collapses due to its own gravity at the end of its life. This collapse results in a massive explosion that ejects material far into space. The resulting detonation can be more brilliant than the entire galaxy that hosts it and can be visible to observers for weeks, or even months. PESSTO (Public ESO Spectroscopic Survey for Transient Objects) is designed to study objects that appear briefly in the night sky, such as supernovae. It does this by utilising a number of instruments on the NTT (New Technology Telescope), located at ESO’s La Silla Observatory in Chile. This new picture of SN2013ej was obtained using the NTT during the course of this survey. SN2013ej is the third supernova to have been observed in Messier 74 since the turn of the millennium, the other two being SN 2002ap and SN 2003gd. It was first reported on 25 July 2013 by the KAIT telescope team in California, and the first “precovery image” was taken by amateur astronomer Christina Feliciano, who used the public access SLOOH Space Camera to look at the region in the days and hours immediately before the explosion. SN 2002ap was one of the extremely rare Type Ic supernovae, also known as hypernovae, recently seen within 10 megaparsecs of the solar system. The hypernova reached a peak magnitude of 12.3. SN 2003gd was classified as a Type II-P supernova, one with a known luminosity, which helps astronomers to measure distances. The supernova occurred 9.6 megaparsecs or 31 million light years from Earth and reached a magnitude of 13.2. It was one of the few supernova events that had a “light echo,” a reflection of the explosion that appeared after the supernova event itself. The progenitor star was a red, M-class supergiant. SN2013ej was first detected on July 25, 2013 about 2.7 arc minutes from the galaxy’s core and reached a peak magnitude of 12.5. It was classified as a Type II supernova, which means that it resulted from a massive star collapsing inward onto its unstable core and exploding. The progenitor star was likely a red supergiant. 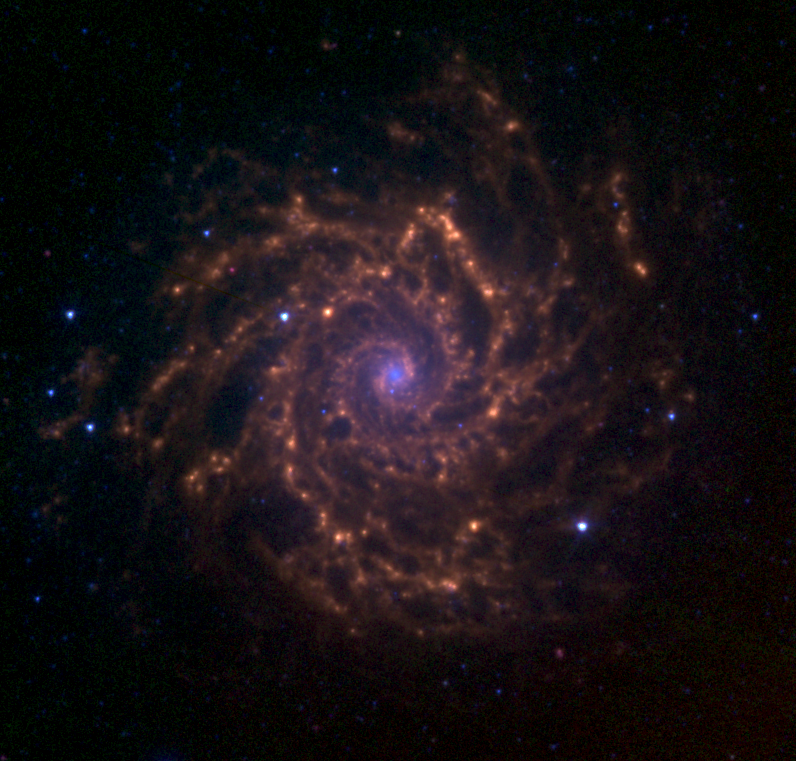 Astronomers using NASA’s Spitzer Space Telescope have spotted a “dust factory” thirty million light-years away in the spiral galaxy M74. The factory is located at the scene of a massive star’s explosive death, or supernova. While astronomers have suspected for years that supernovae could be producers of cosmic dust particles, the technology to confirm this suspicion has only recently become available. 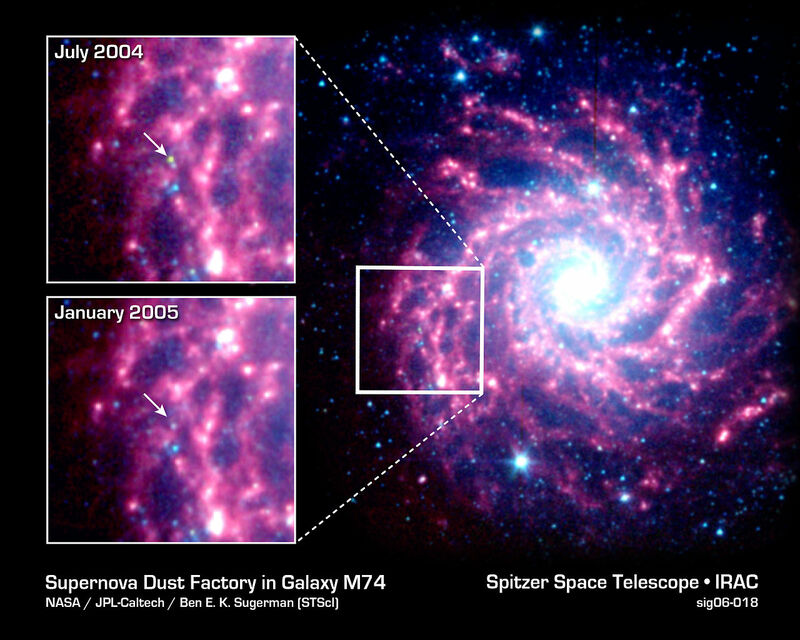 The dust factory, also known as supernova SN 2003gd, is shown at the center of the two small insets from Spitzer’s Infrared Array Camera (IRAC). A white arrow points to its exact location. The yellow-green dot shown in the July 2004 inset (top) shows that the source’s temperature is warmer than the surrounding material. This is because newly formed dust within the supernova is just starting to cool. By January 2005, the dust had cooled and completely faded from IRAC’s view. However, it was still detected in January 2005 by another instrument aboard Spitzer called the Multiband Imaging Photometer (MIPS). The MIPS image is not shown here. Nebula without stars, near the star Eta Piscium, seen by M. Méchain at the end of September 1780, & he reports: “This nebula doesn’t contain any stars; it is fairly large, very obscure, and extremely difficult to observe; one can recognize it with more certainty in fine, frosty conditions”. M. Messier looked for it & found it, as M. Méchain describes it: it has been compared directly with the star Eta Piscium. Very bright in the middle, but the brightness confined to a very small part, and is not round; about the bright middle is a very faint nebulosity to a considerable extent. The bright part seems to be of resolvable kind, but my mirror has been injured by condensed vapours. Messier 74 was one of the 14 “spiral or curvilinear nebulae” discovered by Lord Rosse before 1850. 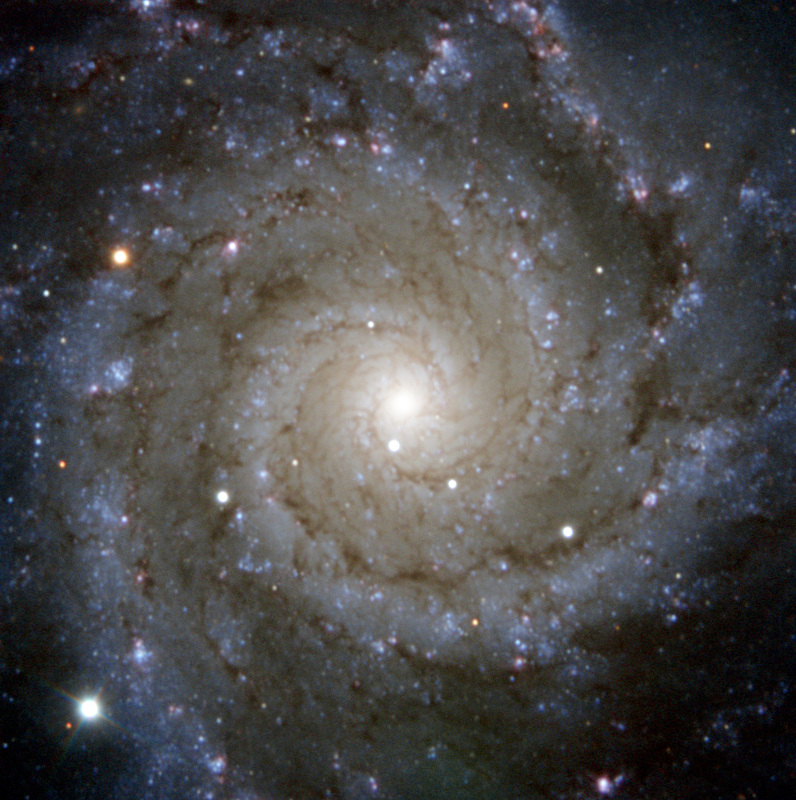 Other Messier objects included on Rosse’s list were the barred spiral galaxies Messier 58 and Messier 77 (Cetus A), the spirals Messier 63 (Sunflower Galaxy) and Messier 88, the intermediate spiral Messier 96, and the grand design spiral galaxy Messier 100.